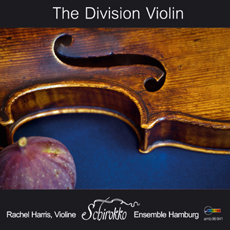 For the first time, a young and aspiring musician has made it her task to record a cd containing a selection of the nicest pieces from John Playford’s well-known collection “The Division Violin” (1684). Along with favourites such as “John, come kiss me now” and “St Paul’s Steeple”, she presents mainly unknown treasures now for the first time on cd. Rachel is supported by her chamber music partners, Andrea Baur (lute), Barbara Messmer (viola da gamba) and Carsten Lohff (harpsichord). Ensemble Schirokko distinguishes itself through its virtuosic use of baroque instruments and the vivacious interpretation of the music. With utmost fantasy and rich contrast, Rachel Harris and her ensemble hold the listener spell-bound.